The minimalist design of the famed Danish designer, Bodil Kjaer always creates a stir when it turns up at Auctions or in Swish Antique Stores. The Desk was used in 2 Bond Movies and Prince Philip and Michael Caine allegely once used them. The Desk is one of the Iconic designs to emerge in the late 1950's and it is rather anachronistic and the onlooker is always surprised to hear that the desk design by Kjaer is nearly 70 Years old. This Desk which is finished in Eucalyptus and Bronze is a superb piece of furniture and would add that 'Bond' feeling to any location. 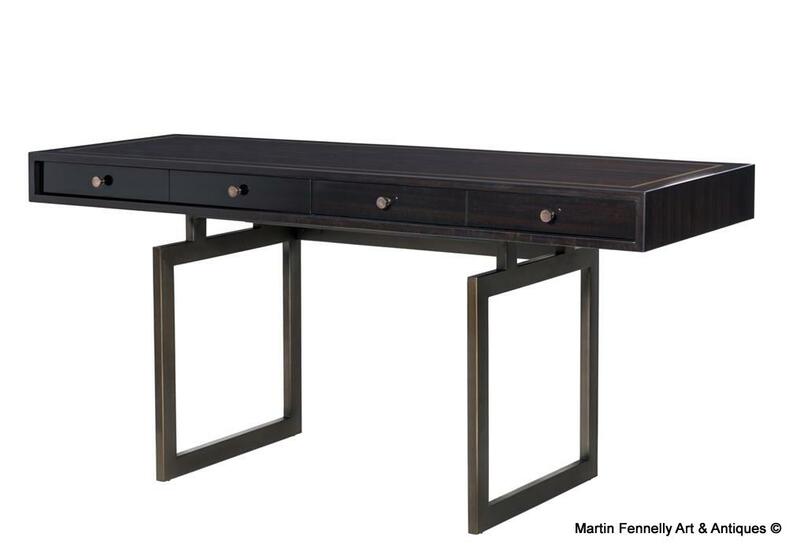 The Desk (after the original) has striking veneer and beautifully made. It is also so sought after with the current trend for Vintage 50's well designed furniture.